Katie was quick to roll, to sit up, to stand. She walked at 10 months, ran at 11. Physically, she has been a dynamo. Climbing, tumbling, maneuvering. But, she was quiet. So quiet, in fact, that concern began creeping into the corners of my brain very early on. Babble she did not. She would make noises occasionally, in the car seat or in her bed. She was bursting with smiles and belly laughs, but, as the months passed, it became clear that her speech wasn’t coming as it does in a typically developing child. We raised our concerns to our families, who assured us that speech delay wasn’t uncommon in each of our families. My father didn’t speak until he was three, Craig’s brother until he was nearly that. So, I would try to put it out of my mind, but there was a nagging there, a relentless voice nudging me to ask more questions, to seek help for our sweet baby girl. We taught Katie baby signs and she got to a point where she was learning a new sign every day. She absorbed them and talked a mile a minute with her hands. It was a beautiful thing to witness. But still, I longed for her to use her voice. We asked our pediatrician, who reassured us, telling us that she was still well within the range of typical development. He pushed us to go home and give her time. We pushed back. We were referred to a speech therapist for evaluation. Katie was fifteen months old by then. At our insistence, this therapist, although partially agreeing with our pediatrician, put us in touch with an agency that would match us with a long-term speech therapist. It took months to get everything in place so that Katie could begin getting help. Through this process we learned just how important it would be to serve as Katie’s advocates. Lyndsey, Katie’s amazing speech therapist, entered our lives when Katie was just 21 months old. There was something magical about her. She recognized the same things in Katie that we had been concerned about. She offered us real validation and her energy brought us optimism. 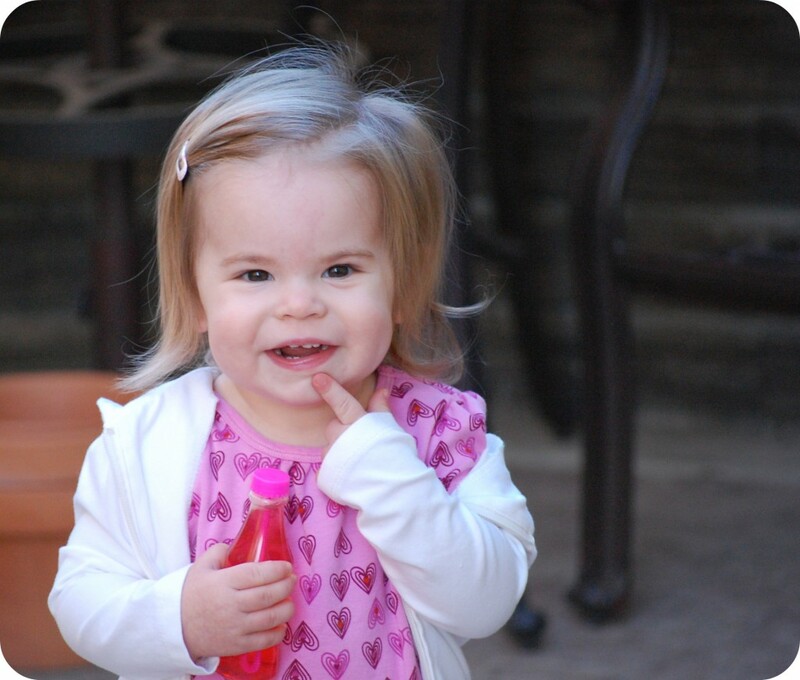 When she first began with our baby girl, Katie said two words: Da Da and Ma Ma. That’s it. She wouldn’t imitate any sounds for us or for Lyndsey. For a few weeks, Katie wouldn’t really engage with Lyndsey. When offered a toy, she would happily accept it and then sit down to play with it, with her back to Lyndsey. She liked her, but didn’t want to do the work that was being asked of her. The weeks passed and I grew concerned that there was something even more frighteningly wrong than I had previously thought. I became obsessed with diagnosing her and Googled everything. I bought books and read everything that I could get my hands on. I eventually settled on a diagnosis of apraxia of speech. I shared my concerns with Lyndsey, who encouraged me to resist diagnosing Katie, as even if she did indeed have apraxia, she couldn’t be tested for it until she was three. Each time I brought it up, Lyndsey heard me out, calmed me down, and made me focus on the progress that Katie was making. She empowered me by offering me ideas for how I could help Katie, teaching me techniques and helping me to focus on the ways in which Craig and I could have an impact on Katie’s development. In one of the most helpless times of our lives, she gave us power. We will never forget that. Lyndsey provided us with notes with an action plan after every session. I have the therapy notes from their very first session in front of me now. Lyndsey’s advice to us then was to “[m]ake it fun and relax!” She could see early on that she would have to work her magic on not just Katie, but on us too. Craig and I cherished these session notes and will never part with them. Each Thursday evening, after we put Katie to bed, we would read the notes and talk about how we could work together to implement Lyndsey’s suggestions. Those words were like gold to us. Very slowly at first, and then with increasing speed, Katie began trying. She would imitate sounds with Lyndsey’s encouragement. I have never seen someone so intent on getting to know our daughter…to learn what motivated her, what discouraged her. She knew when to push Katie and when to let her just be. Lyndsey never gave up. Even when a few weeks would pass and Katie would be stalled, Lyndsey focused on the progress that had already been made rather than discussing the plateau. She came to our home every week, ready to work and to challenge our baby girl to push herself. They have worked together, as an amazing team, every week. We look forward to Thursdays, at first to see the baby steps and now to see the sparkle in Katie’s eye when she hears Lyndsey’s knock at the door. They have a closeness that I wish I could capture and hold in my heart for always. It comforts me in a way that I can’t define. Over the past 18 months, Lyndsey has become a part of our family. She is the person who knows Katie best aside from us. She is the one that I turn to who I know will understand the way I feel about this child. She feels it too. She has become our friend. It is so incredibly difficult for me to relinquish control and in those early days, Lyndsey asked me to do exactly that. She asked that I focus on what I could control and leave the rest to her. She took part of our burden and let us focus on playing with Katie and released us to celebrate the progress that Katie was making across the board. She gave us back our daughter. She gave us the permission we needed to just enjoy being Katie’s parents. Tomorrow is Katie’s last session with Lyndsey and I’m just not ready for that relationship to end. Yes, we’ll be friends. For always. But she motivates and energizes Katie in a way that I cannot. Her positive attitude is infectious and she has been such a strong presence in our lives. I will never find the words to thank Lyndsey. I could tell her a million times over, but I have come to realize that now I am the one without words. I suspect that one conversation with Katie gives Lyndsey something that our words cannot. Katie’s development is a true testament to Lyndsey’s amazing work and diligence. And Lyndsey’s huge gift to us is the sound of our baby girl’s voice, full of joy, saying “I love Mommy, Daddy, and Matthew,” with beautiful clarity. Thank you, Lyndsey. We love you, we admire you, and we cherish you. You’ll be a part of our lives forever. If you suspect that your child has a delay, please trust your gut and push for an evaluation. Early intervention plays a huge roll in helping children to overcome developmental delays. (Should Katie’s progress continue as it has, she should no longer need speech therapy once she begins school; this would likely not be the case if we hadn’t sought help as early as we did.) The process of getting services in place can be lengthy, so don’t delay. (In our case, it took six months from our pediatrician’s first referral until the time when Katie began services.) Should you no longer need the services when they become available, you can simply decline them. Sigh. Oh, yes. You know that I understand intimately how precious it is, when you need help for your child, to find that help. To find a person who will get in it with you, love your child, and be devoted to your child AND to your family. Carter's last psychologist was an intern, finishing up a PhD in neuropsychology. He graduated in June and left us, after 1 1/2 years of the very best, most compassionate, professional care I could ever have dreamed of. He was a dream for us, one of the first group of professionals to truly hear us and understand that Carter was in trouble. So yes. Yes. I hear and understand this sadness and this enormous, unfathomable gratitude. I'm so glad that you have had Lyndsey, and sad that you have to say goodbye. I am so, so glad that you've been able to find such good, true help. It's so difficult to find someone who can truly fit into your family this way, especially when you are stressed. What a lovely woman – I'm sad to see her go as well. What a moving post. My son wasn't talking either at 15 months and our pediatrician told us the same things. Since he was a second child, everyone attributed his delayed speech to having a brother to talk for him. Finally someone paid attention. We found out that his extreme and constant ear infections had affected his hearing which had affected his speech. We too found a great therapist who worked with him post-surgery. You are so right to encourage parents to push for help. No one knows a child like a mom. Thanks for sharing. My son (who is now 7) had delayed speech as well. This post took me back to that time. How wonderful you found someone like Lyndsey and also that you pushed back because you felt something wasn't right. Once our son was evaluated (at the age of 2 yrs) they felt that with a couple of sessions he would be fine. And he was. Now he is in 2nd grade and struggling with reading. We work very closely with the school and hope that this helps eventually. Thanks for a very moving post – I'm so happy that your daughter received such wonderful care. My older daughter entered speech therapy when she was two and half. She had about ten words, none of which she used reliably. NONE. So really? No words. I was all broken with grief and longing and loneliness. And then there was a speech therapist. Janis Ahern. She is not in our lives any more, but for a while she was. And she brought magic. And she gave me Maj.
And now? I am crying. I am so happy you were able to find someone like Lyndsey to help your beautiful daughter. this post? is beautifully written and so moving. I am so happy you found Lyndsey and that she could give you Katie. I can't imagine not hearing Eddie's voice. This post had me crying. I am so glad you are tough and persistent and wonderful. Lyndsey may have been the most obvious person to help Katie find her voice, but without you as her momma? She wouldn't have found Lyndsey. You are wonderful. It's funny how you can sometimes look back on life and see a moment that was life defining. Welcoming Lyndsey into our home, that very first day, was one of those moments. I never doubted that she was the right therapist for us. I just knew we were meant to know her. I wish that you could just see her…see the light in her eyes and the comfort she exudes. Lyndsey is genuinely beautiful, both inside and out. There have been so many times in my life when I wondered if I was overreacting, as I have a tendency to do so. In this instance, I was 100% certain that my instincts were correct. I am so gald that I trusted myself. It's not easy to stand up to a "professional" when they are telling you that you're wrong. If even one parent pushes back as a result of reading this post, I will be so happy. That's the one thing that I learned so early on…that this was just the beginning of my experience as Katie's advocate. Like you, I believe that we have to follow our children's development closely, to know how they are progressing so that we can help them in every way possible. I'm so pleased that you came by. That Maryline is so incredibly thoughtful. Your words express exactly what I felt in those early months. Janis and Lyndsey are gifts. And yes, pure magic. And now? Maj is apparently never at a loss for words. And that? Is a beautiful thing. We were so very lucky to have found her. I have pinched myself more times than I can count. This is such a gut-wrenching time for me. There's a part of me that is truly terrified to go it alone…I feel like our family still needs Lyndsey. But, I keep reminding myself that one of the most beautiful things about Lyndsey is that she empowered us by giving us the tools that we would need when this day arrived. She is an amazing woman and she has helped to shape Katie's young life. How do you thank someone adequately for that? To all of the wonderful mothers who have shared their stories in this blog, I thank you! This is the reason I became a speech therapist; to give children a voice and to see the happiness in their faces when they feel successful! Nichole this post is by far the most wonderful thing anyone has ever written about me…I am forever humbled by your thanks. Thank you for trusting me during a vulnerable time in your life as a parent. Katie is true magic and you are not getting rid of me even if you try! I can't wait to see her continue to grow! Lyndsey is such an amazing woman and speech therapist. She has worked with our son, Nick, since he was 22 months old – first through early intervention, and now in his preschool program. When she began he had no speech whatsoever, and now, on the cusp of his 4th birthday, we can't get him to STOP talking. She has been there to help our family through every step of Nick's difficult transition, and deserves every accolade you have given her. It is so wonderful to hear the story of another family she has blessed as much as ours. Keep up the fight for your daughter! I've known Lyndsey since she was a small child and it is wonderful to see who she has become. I am so proud to know someone who has so much value. What a wonderful impact you make on peoples life Lyndsey. Lyndsey's comment made me cry. I think it is a hard thing for parents to trust their gut when families, friends and health professionals are against them. Hey Nichole, that's a feat! You made the speech therapist speechless! What Lyndsey has is pure magic. And I'm growing familiar with having a child who does not stop talking. Ever. Oh, how I prayed for this day. Even on Thursday, as we were saying our goodbyes to that part of our relationship, Lyndsey was offereing to be there for us as we continue down our path. She is generous, kind, and loving. Our family, like yours, has been blessed to know her. I can't imagine how rewarding it would be to impact the lives of so many people…to open doors and build confidence. What makes Lyndsey so amazing is the beautiful combination of being an outstanding professional in her field while also being a remarkable human being. That's exactly it, Kristin. When you have your doctor telling you to try to relax, but there is just something in your brain insisting that something is amiss, it is easy to feel intimidated and small. Having Lyndsey validate our concerns marked the first true step in our journey to helping Katie find her voice. What I have written here represents just a hint of how strongly we feel about you. I will always credit so much of Katie's personality to you…you helped us teach her to push herself and trust in her abilities. She's already asking about your visit on Thursday. I'm not sure she completely understands the change. It might be wise to expect a call! i am highly irked that I somehow missed this post when it posted, but have to comment and just how very very happy I am that you and Lindsey found each other. And there are times when I thank the stars that I found this profession (although the majority of my work has been with adults, I started as a nanny to a hearing impaired little boy). It is amazingly rewarding and stories like this affirm that choice, sitting in my rental house in Santa Cruz twenty years ago, contemplating a change in major. I'm WAY late on this, but I know the kind of heartbreak and worry of which you speak all too well. I don't know how the SLP do it, but they had my girl up and running w/in a few weeks, and she graduated in 6 months. She had maybe 10 words at about a year – and had the same 10 words at 18 months. I knew that wasn't right. And she didn't parrot at all. She was diagnosed w/ severe speech delay, and it was sad to see such a bright child become so frustrated. I am glad you trusted your gut and that you found Lyndsey to help bring the best out of your baby girl. I was worried about Maddie from early on, too. Kate was talking in paragraphs before age 2, and Maddie was soooo quiet and wouldn't even TRY to talk. We've only had 2 sessions of therapy so far, though we've seen an improvement just since starting an early ed program 2 mornings a week. A factor in Maddie's problem is tied to a physical problem with her tongue/muscle control of the tongue, so I hope as she gets stronger and has better control of the tongue, her articulation and expression will get tons better. I am just now reading this, a year later. And now that my daughters been seen by EI for 4 or 5 months….and the teacher that comes into our home has become someone special to Sophia the idea of her not coming makes me sad. Mostly for Sophia. But also for me. I really like her. I enjoy watching Sophia make a friend in someone that isn't related to her. Luckily she'll be coming until Sophia is 3, and we're a month away from her 2nd birthday. So we have a while. But when we started EI Sophia said NOTHING. Not a word. Babble, yes. Words? No. Now, she's up to 20 words. Including phrases. It really is a gift. And there really is no way I'll ever be able to thank her teacher (and her speech therapists) enough for that.